You might remember the impressive magazine collages of Megan Coyle that caught my eye more than a year ago. Megan has been very busy since then creating thirty vivid designs to illustrate a charming story for small children. It's about a sweet mallard and flying fish who meet one another at the beach and ponder what it would be like to live the life of the other. (Aw look, they're smiling!) Most of us wouldn't be able to bring personality and dimension to bits and pieces of flat magazine pages, but Megan makes it look easy. Will Duck and Fish decide to trade places? I must say Fish looks pretty upset while flying over an airport! But on the other hand, Duck seems to be getting along swimmingly in the underwater world. I wonder how things will work out?! Duck and Fish can be previewed and purchased on Blurb. Saskia Akyil and I met when she asked me for photography advice regarding the cover she'd just quilled for her first young adult novel. Yes, a quilled design on a book cover - what an eye-catching idea! We struck up a conversation... Saskia, a young American mom living in Germany, was inspired to do the cover art after seeing Yulia Brodskaya's work. She's the first to admit she's a novice quiller. "I'm sure I'm not the only person who saw Yulia's artwork in Oprah magazine and thought "Wow, what is that? I want to do it!" Regardless of Saskia's skill level, the colorful designs on both the front and back covers will grab the attention of young readers everywhere. Maybe they'll even be enticed to give quilling a try - that would be nice! 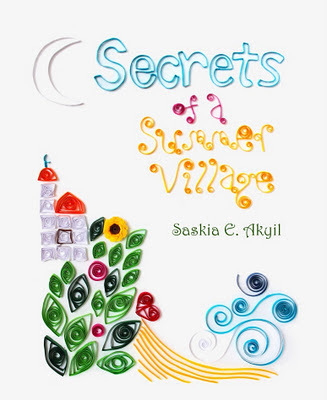 Secrets of a Summer Village, is listed worldwide on Amazon as a print book. It's also available electronically as a Kindle download from Amazon. I think some of the best artwork is done for children's books. Coyle's is so charming; it reminds me of Eric Carle's wonderful books. Makes me wish my son weren't all grown up. Congratulations to Saskia Akyil. Eye-catching cover art! What a wonderful idea of story telling with the help of magazine collages. It looks so good almost like it is water colour painting. The quilled design for a book cover is a brilliant idea. Ooo, books! Great artists to spotlight. I especially like Megan Coyle's work and agree that it is reminiscent of Eric Carle. thank you for always finding & sharing new ways to show paper & quilling! read the few pages of the summer in Turkey, interesting! If any of you read my book, Secrets of a Summer Village, please let me know what you think of it. Also, comments on Amazon would be most appreciated!